A medial collateral ligament (MCL) injury is a stretch, partial tear, or complete tear of the ligament on the inside of the knee. It is one of the most common knee injuries and results mostly from a valgus force on the knee . A ligament, made of a lot of collagen fibres and little elastic fibres, not only functions to control excessive motion by limiting the joint mobility but is also a source of proprioception. Its function is to resist forces applied from the outer surface of the knee and so prevent the medial portion of the joint from widening under stress. Proprioceptors are located in ligaments but also in muscles and joint capsules. These proprioceptors monitor the position of our limbs in space, our movements, and the effort we exert in lifting objects. Grade 2 tears vary in symptoms and therefore they are broken down further to grades 2- (closer to grade 1) and 2+ closer to grade 3, but both of them count as having tenderness but no instability. The pain and swelling are more significant than with grade 1 injuries. When the knee is stressed (as for grade 1), patients complain about pain and significant tenderness on the inside of the knee, moderate laxity in the joint is observed. Obviously, this means that a grade 3 tear is a complete rupture of the MCL, resulting in instability. Patients have significant pain and swelling over the MCL. Most of the time they have difficulty bending the knee. As stated before a grade 3 tear results in instability, when the knee is stressed (as described above) there is joint laxity. Grade III MCL injuries have an extra scale to measure the extent of the instability. These are described from the amount of joint separation in the 30° valgus test, more information here. Lachmann test for ACL stability should be accomplished when a grade III MCL instability is present. Grade I and II injuries have well-defined end points contrary to a grade III tear that occurs a soft end point with valgus stress testing. A grade 1 tear consists of less than 10% of the collagen fibers being torn. Grade 2 tears vary in symptoms and therefore they are broken down further to grades 2- (closer to grade 1) and 2+ (closer to grade 3). Obviously, this means that a grade 3 tear is a complete rupture of the MCL. When the knee is stressed (as for grade 1), patients complain about pain, moderate laxity in the joint and a significant tenderness on the inside of the knee. When we speak of a grade 3 tear of the MCL. patients have significant pain and swelling over the MCL. Most of the time they have difficulty bending the knee. Another common finding of a grade 3 tear is instability. When we stress the knee (as described above) there is joint laxity. A committee of international knee experts created the International Knee Documentation Committee Subjective Knee Form (IKDC-SKF), which is a knee-specific, rather than a disease-specific, measure of symptoms, function, and sports activity. IKDC-SKF is a reliable and valid knee-specific measure of symptoms, function, and sports activity that is appropriate for patients with a wide variety of knee problems. Outcome is related to the severity of the injury and the functional rehabilitation possible. A clinical evaluation is important to judge whether the injury is localised in the MCL or whether other structures are damaged. First of all, a lot of information can be obtained by the patient’s description of the injury. Secondly the contralateral knee should be examined so both legs can be compared. When inspecting the knee, it is important to determine the presence of swelling and localise it. Normally an isolated swelling is seen on the medial part of the knee. It is important to palpate the MCL along the medial aspect of the knee and that it’s assessed for tenderness, noting the location (femoral vs tibial sided) of maximal tenderness . With this point of view we can almost be sure that the MCL is injured. Thirdly attention to the mechanism of the injury is important to identify which structures are damaged. In addition, it’s important to notify that the best time for examination of the knee immediately is after the injury before any muscle spasm can occur. Unfortunately, this opportunity is only available when there are physicians present at the time of injury. In those patients with severe muscle spasms, it’s usually sufficient to give them a 24-hour period of immobilization for relaxation, and examination under anesthesia is rarely necessary. Laxity to valgus stress with the knee at 0° indicates the possibility of a combined injury. This will be likely with an injury to the cruciates or posteromedial capsular structures. For further information about this test and its interpretation, you can consult the physiopediapage Knee examination. A second test may be performed to examine the medial collateral ligament namely the Swain test. This test examines the chronic injury and rotatory instability of the knee. The test is performed by flexing the knee into 90 degrees and externally rotating the tibia. This position of the knee tends to a relaxation of the cruciates while the collateral ligaments are tightened . When pain is felt on the medial side of the knee, an injury to the MCL complex is probable . Magnetic resonance imaging (MRI) is also an important tool for the examination of an injury of the medial collateral ligament. It is currently the only instrument that can visualize the morphological and functional joint impairment. The first three grades are the same as for every ligament injury. 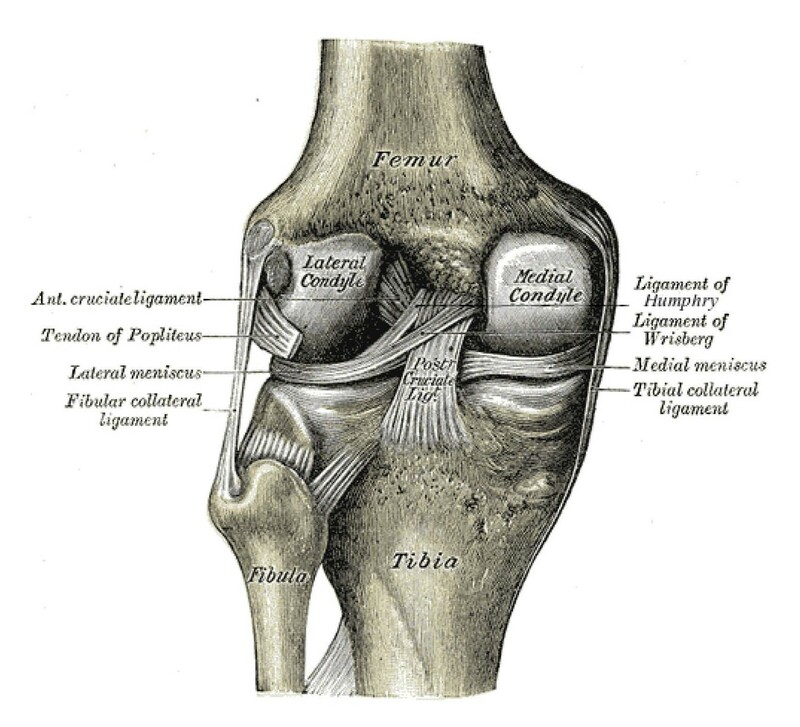 Grade I is sprained, grade II is partial tear, grade 3 is complete tear of the ligament. Some surgeons describe a grade four injury, also called a medial column injury, to the MCL. It occurs when the injury effects more than just the medial collateral ligament (MCL) and may require surgery. Injuries commonly seen in combination with medial collateral ligament injuries are anterior cruciate ligament (ACL) injuries, bone bruises, lateral collateral ligament injuries (LCL), lateral and medial meniscus tears but also posterior cruciate ligament injuries (PCL). ACL disruption are most common associated with high grade MCL tears. In case of a grade III injury, results of non-operative treatment are less univocal. The treatment is depending on whether the injuries are isolated to the MCL or whether they are combined with other ligamentous injuries, their location (more to the tibial or the femoral side of the ligament) and the involvement of posterior structures. With the MRI imaging, it is possible to locate the exact location of the injury which can help to decide the treatment decision . So the injuries with a multiple ligament involvement (grade 4), may require reconstruction or augmentation on an acute basis. Augmentation can be done with different techniques.When performing an augmentation, tendon from muscles for example the hamstrings are used to ‘replace’ the ACL. The failure not to recognize combined injuries or incomplete healing of the medial side of the knee, can lead to continued chronic valgus and rotational instability and functional limits. Especially when there is involvement of the posterior oblique ligament complex (POL). There had to be special attention to identifying involvement of the posterior oblique ligament and capsule . Some researchers have reported good results after non-operative treatment of grade III MCL injuries, but the results are not as consistent as grade I and II tears. Most of the isolated grade III injuries are based at the femoral site, and do not require surgery. An important test to see if surgery is needed, is to see whether the posterior oblique ligament (POL) and posterior capsule are damaged. Surgery also should be considered when the pes anserinus tendons are damaged. Situations with injury over the whole length of the superficial layer are a complete injury of both the superficial and deep MCL from the tibia are typical injuries that are better treated with an operation. Grade III injuries that are unstable in 0 degree extension do also fall into the category where an operation is recommended . In addition, we should note that a surgical reconstruction is recommended for isolated symptomatic chronic medial-sided knee injuries. The treatment of a medial collateral ligament injury rarely requires a surgical intervention. The extracapsular, the medial collateral ligament, appear to have a fairly robust potential to healing (level 1A). In cases where instability excist after nonoperative treatment, or instances of persistent instability after ACL and/or PCL reconstruction, the MCL tear may be addresses through surgical repair or reconstruction (level 1A). The most isolated MCL injuries are successfully treated non-operatively with bracing or immobilization. Some simple treatment steps, together with rehabilitation, will allow patients to return to their previous level of activity. The most treatment protocols focusing on early range of motion, reducing swelling, protected weight bearing, progression toward strengthening and stability exercises. The general goal is to have an athlete or patient return to full activities (level 1A) . To initiate M. Quadriceps activation in the initial hours to days after injury. The treatment for isolated grade 1 injuries is mainly non-operative. During the first 48 hours, ice, compression and elevation should be used as much as possible. In general, incomplete tears of the MCL are treated with temporary immobilization and use of crutches for pain control. Isometric, isotonic and eventually isokinetic progressive resistive excercises are begun within a few days of the subsidence of pain and swelling. Weight-baring is encouraged, the rate being dictated by the level of pain. Level of evidence: 1a . For a grade 2/3 injury-treatment it is important that the ends of the ligament are protected and left to heal without continually being disrupted. One should avoid applying significant stresses to the healing structures until three to four weeks after the injury to ensure that the injury can heal properly. The treatment for grade 3 injuries depends on whether the injury is isolated or combined with other ligamentous injuries (level 1A). For a grade 3 medial knee injury combined with an another injury for example an ACL tear, the general protocol is the rehabilitation of the medial knee injury first so it can allow to heal according to the guidelines for an isolated medial knee injury. When there is good clinical and/or objective evidence of healing of the medial knee injury, mostly 5 to 7 weeks after the injury, the reconstruction of the ACL can begin. Level of evidence: 1a. Phase one is from one to two weeks. Phase one consists of controlling the swelling of the knee by applying ice for 15 minutes every two hours (first two days). The rest of the week the frequency can be reduced to three times a day. Use ice as tolerated and as needed based on symptoms. In the begin the patient need to use crutches. Early weight bearing is encouraged because patients who increasing their weight bearing, they can progressively reduce their dependence on crutches. Afterwards progress to one crutch and let the patient stop using the crutches only when normal gait is possible. Another aim of this phase is trying to maintain the ability to straighten and bend the knee from 0° to 90° knee flexion. For achieving the range of motion of the knee it is important to emphasize full extension and progress flexion as tolerated. Pain free stretches for the hamstrings, quads, groin and calf muscles (in particular) are suggested. At last there are the therapeutic exercises. The patient may begin with static strengthening exercises (as soon as pain allows it). They consist for example of Quadricpes sets, straight leg raises, range-of-motion exercises, sitting hip flexion, sidelying hip abduction, standing hip extension, standing and hamstring curls. As soon as patients can tolerate it, they are encouraged to ride a stationary bike to improve the range of motion of the knee. This would ensure an accelerated healing. The amount of time and effort on the stationary bike is increased as tolerated. Obviously, every patient is different and these are not the standard exercises that has to be given to patients. There are no limits on upper extremity workouts that do not affect the injured knee (level 1A). It’s important that the patient rests from all painful activities (use crutches if necessary), and that the MCL is well protected (by wearing a stabilized knee brace). Starting at week three phase two begins. The aims for the range of motion are the same as in phase one. Progress to 20 minutes of biking. Increase also the resistance as tolerated by the patient. Biking will ensure the healing, rebuild strength and maintain the aerobic conditioning. The physiotherapist can give other exercises like Hamstring curls, leg presses (double-leg) and step ups. As precaution the patient has the chance to be examined by a physician every three weeks to verify the healing of the ligament (level 1A) . Phase three starts from week five. Major goal for this phase: full weight-bearing on the injured knee. Discontinue the use of a brace when ambulating with full weight bearing is possible and there is no gait deviation. The range of motion has to be fully achieved and had to be symmetrical with the not injured knee. The therapeutic exercises are the same as in phase two. They may benefit progression. We continue with cold therapy and compression to eliminate swelling. In this phase you can commence with balance and proprioceptive activities. To maintain aerobic fitness the patient can use the stepper or (if possible) may begin to swim. As precaution the patient has the chance to be examined by a physician every five to six weeks. When needed, you can be allowed to make stress radiography as precaution (level 1A). Six weeks after injuring the knee, phase four can begin. Discontinue wearing the brace during the gait. Athletics can wear the brace for competition through competitive season for at least three months. Cold therapy still needs to be applied. The aim of the therapeutic exercises is more focused on sport specific or daily movements. The intensity of the strengthening exercises need to be increased and instead of double leg exercises we change to single leg exercises. The patient may start running again at a comfortable pace (make sure the patient doesn’t make sudden changes of direction). As precaution it is best to return the competition once full motion and strength is returned and when the patient passes a sport functional test (level 1A). Applying cold therapy reduces swelling immediately after injuring and doesn’t help the healing process of the ligament (level 1A). As in many cases, a sufficient warming–up helps to prevent injuries at the medial collateral ligament. Particularly neuromuscular warming–up programs seem to be efficient in reducing several injuries concerning the knee joint. Programs including exercises targeting on leg and core muscles, balance, landing techniques and proper joint alignment prevent lateral trunk displacement and excessive knee valgus. As mentioned already these are two risk factors for this type of injury. Exercises such as side-cutting and single-leg landing may be included in the warm -up. These are high-risk movements. By doing them controlled in the warm-up, it will ensures that the knee can react appropriately to these movements . A medial collateral ligament (MCL) injury is a stretch, partial tear, or complete tear of the ligament on the inside of the knee. A valgus trauma or external tibia rotation are the causes of this injury. This injury is categorized in 3 grades: I, II and III. The category depends on the degree of pain or degradation of the knee joint. The therapist can use the valgus stress test to see if the diagnosis is correct. There are several rehabilitation methods for an MCL injury, rest is the most important though. While resting, the MCL has time to recover. There are other rehabilitation techniques as well, like patellar/soft tissue mobilizations and frictional massage, gait training, cold therapy etc. In rare situations, surgical intervention is necessary. ↑ Frommer, Chana, and Michael Masaracchio. "The use of patellar taping in the treatment of a patient with a medial collateral ligament sprain." North American journal of sports physical therapy: NAJSPT 4.2 (2009): 60.